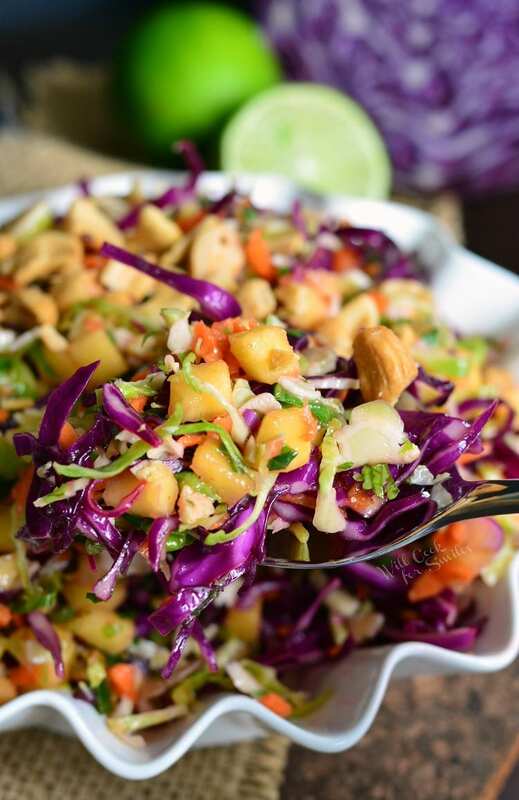 Crisp and flavorful Tropical Slaw to serve with your grilled meats. 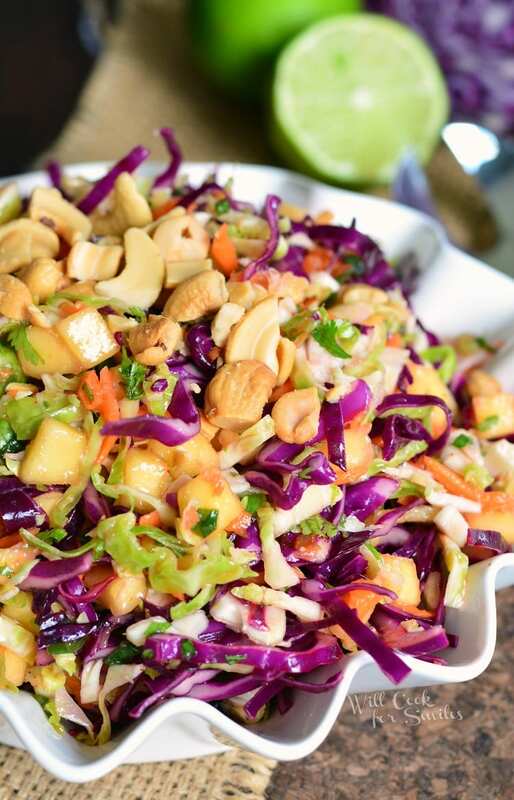 This slaw is bursting with sweetness and citrus flavors from mango and lime juice. 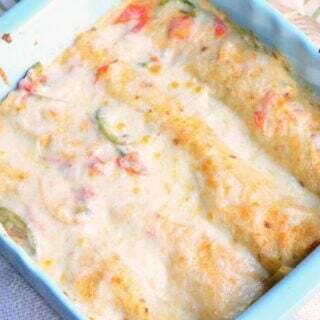 It also goes perfectly on tacos and sandwiches providing additional layers of flavor. During the summer months, I try to come up with more cold side dishes and salads because noone wants to stand over a hot stove all night. It’s hot enough outside and hot enough when you have to stand over the grill to also stand over the stove. 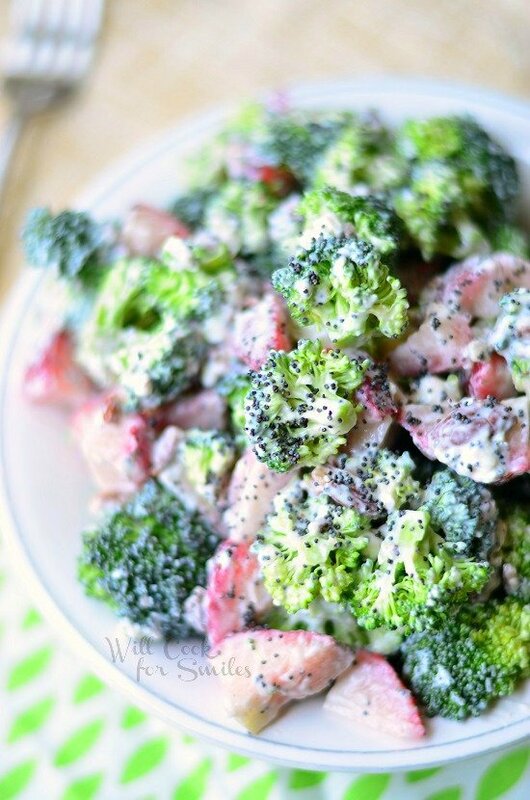 Coleslaw, cold salads, broccoli salads, fruit and berry salads, all require no cook time at all, in addition to being served cold. 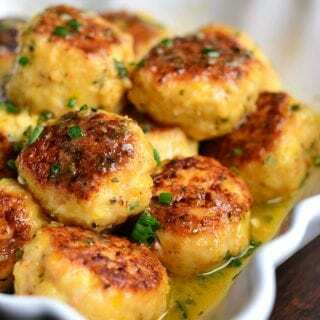 Those are the perfect side dishes for hot summer outdoor parties. 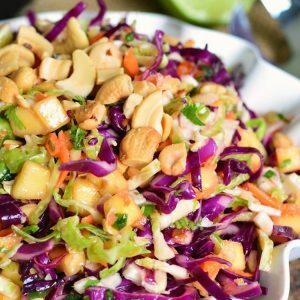 This Tropical Slaw is perfect for summer time as well, not just because it’s easily and quickly prepared without any cooking, but it’s also packed with delicious tropical flavors. 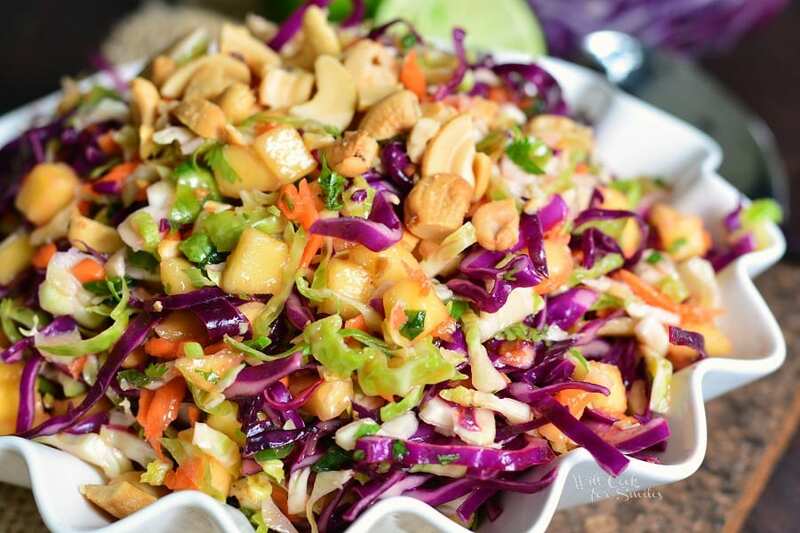 This slaw is made with juicy, ripe mango, fresh lime juice, cashews, fresh herbs, and spiced with some cayenne pepper. 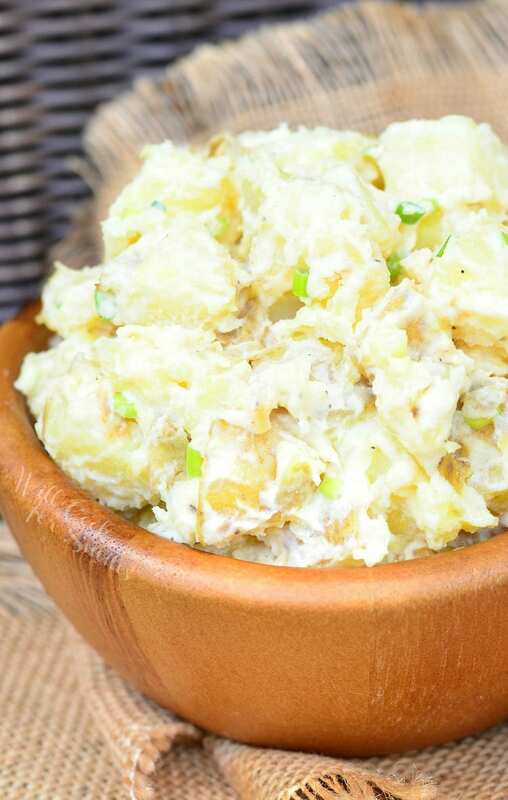 But, barbecue parties is not the only good time to serve this side dish. 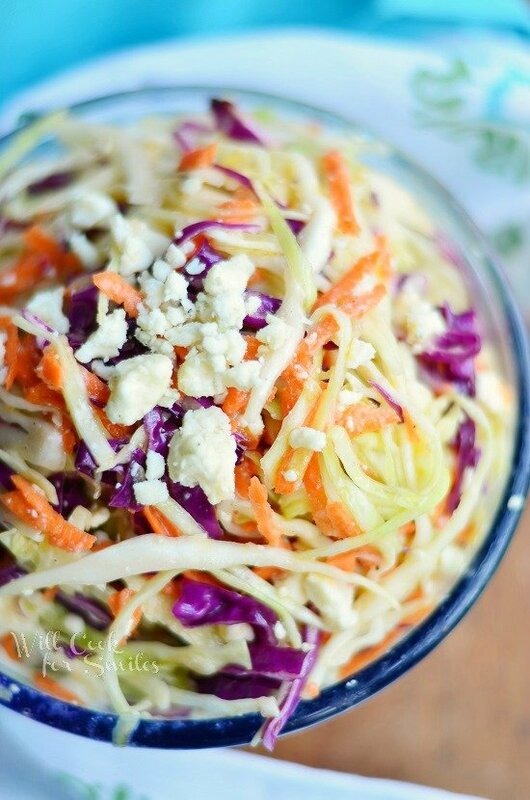 This slaw is amazing on top of tacos and sandwiches. I served this slaw with some pulled pork tacos last week and it was great together. While making the pulled pork, I added some flavors that would be complimentary to the slaw. I added some lime juice and chipotle chili powder to the cooked pulled pork. I also cooked the pork shoulder rubbed with some brown sugar spice mix for a touch of sweetness. That went very well with the coleslaw as well. I will make sure to share these tacos in the next couple of days! 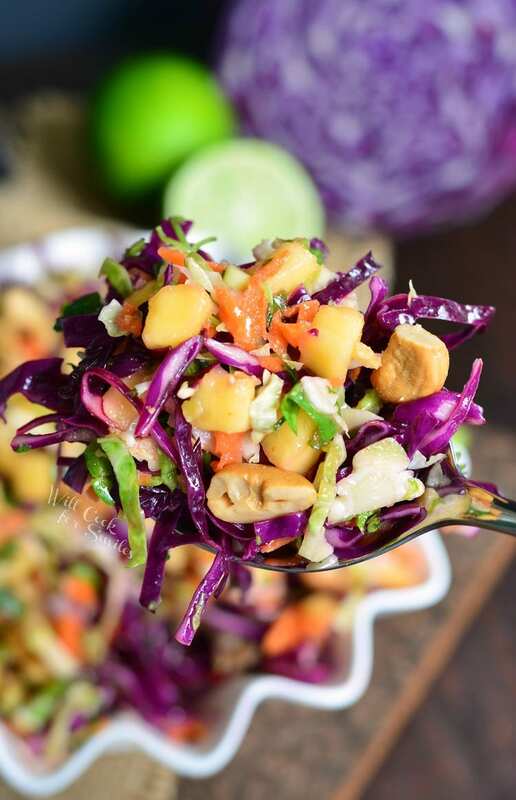 This slaw is bursting with sweetness and citrus flavors from mango and lime juice. 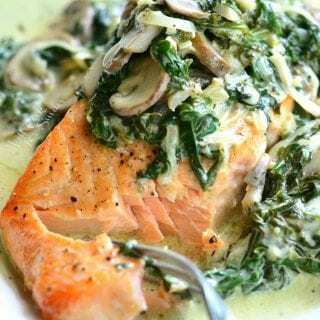 Slice cabbage very thin and add it to a large mixing bowl. Peel and grate the carrots. 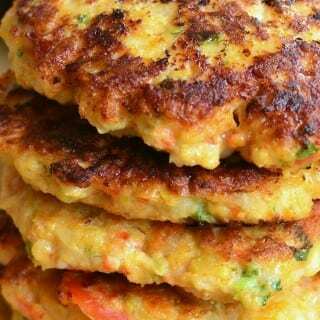 Add grated carrots to the cabbage. Peel and chop mango meat and add it to the bowl with cabbage. 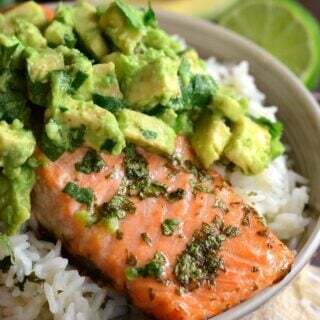 Add chopped green onions, lime juice, sugar, minced cilantro, olive oil, and some cayenne pepper. Gently mix everything well. Add cashews and gently mix them in. **Note: the exact amount of slaw will depend of the size of the cabbage. 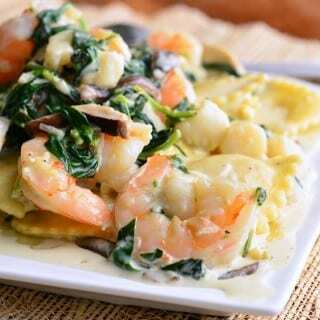 Do you have nutritional info calculated for this recipe or am i just not seeing it? Thank you!